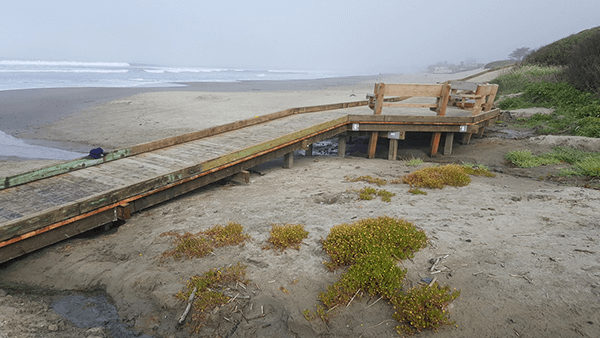 The weather may not make you think of heading to the beach just yet but the newly installed beach access ramp at Stinson Beach is a great reason to go. People with mobility disabilities can now get on the beach without actually getting sand in their toes, so to speak. The wooden path with a large viewing deck leads over 100 feet to the high tide line: a guardrail will be installed later this summer. Two beach wheelchairs (not self-operated) are available to loan but you must make prior arrangements to get the code to the locker where it is stored by the accessible parking spaces in the center parking lot. There is a dressing table and accessible bathrooms right by the beach access path. Other access improvements include accessible picnic tables. One table by the southern parking lot even has more than one wheelchair space. For a great view of the beach in a partially enclosed deck head over to the snack shop at the base of the main lifeguard tower. The path up to the café is steeper than 1:12 (the ratio of a ramp that meets accessibility codes) but it is easily manageable in a motorized wheelchair; there is very limited accessible seating at the tables. Click here for a screen-readable version of GGNRA’s access guide for Marin County.